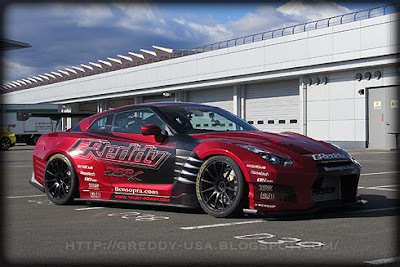 In this video, Greddy Performance takes their R35 GT-R, with the wild Ben Sopra body kit to Fuji Speedway, to try and go over 200 mph. The car is fortified with a 4.3 liter engine, pushing over 1250 horsepower. Visit http://GReddy.com for more information. TRUST, Japan R&D project for Top Speed Challenge, GReddy 35RX GT-R. Fearless Option Video driver Tarzan Yamada takes to the Fuji Speedway for high speed test, over 200mph! 1250ps via GReddy 4.3l stroker engine and twin TD06-20G Twin Turbo kit. Type-29 Intercooler, DCT Cooler kit, DCT cooling pan, high-flow Intake Manifold, GReddy Exhaust. Art Factory Livery. BenSopra wide-body Aero kit.